Tillie got a mini-version of 4 year old preschool today. She thought it was too short with not enough playing time. 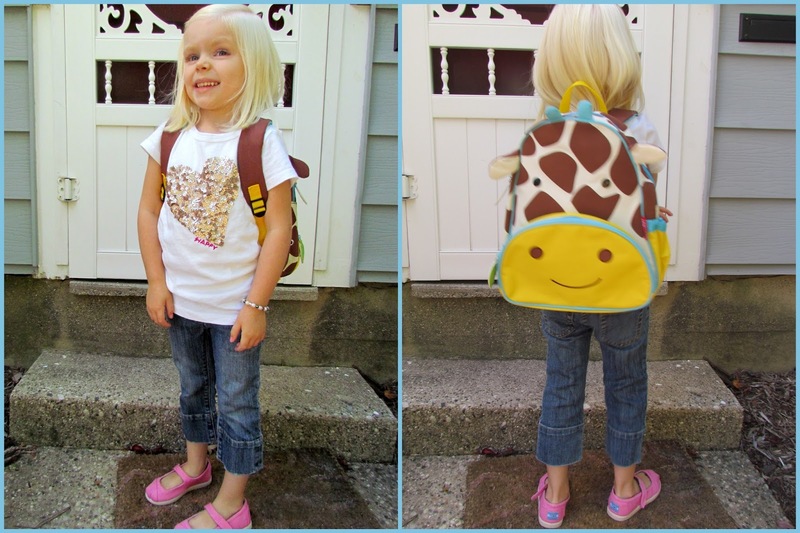 She wore her crewcuts cropped denim(3y -- I still can't believe I got these at Goodwill. I LOVE them on her.) and sequin heart tee. We bought these pink maryjane TOMS at Nordstrom Rack this summer and I made her save them for school. She was so excited when I finally cut the tags off today. She's been dying to wear them. I wasn't planning on getting her a new backpack this year, but I got this SkipHop giraffe one for free last spring with Piperlime credits. It seems like everyone has the owl backpack, so I like that she has something a little different now.